Rick Potvin is the manager of the McKinney National Wildlife Refuge on Long Island Sound. He oversees coastal and low-lying habitat for wildlife. Rick says, "What we need to do is to get our habitats in the most robust condition we can - because there will be a tipping point, and the species that... get on the other side of the tipping point in global climate change, they will probably survive." 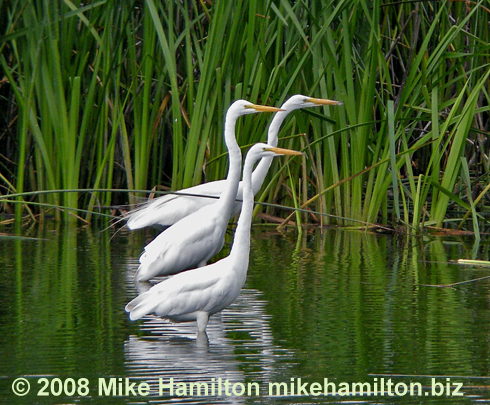 Great Egrets like these, which nest on the refuge, would benefit. Today we’re on a windy island in Long Island Sound, with Rick Potvin. As Manager of the McKinney National Wildlife Refuge, Rick oversees coastal and low-lying habitat for wildlife. Rick says he’d about had it attending meetings predicting what will happen to those areas as the climate changes. “What we need to do is to get our habitats in the most robust condition we can – because there will be a tipping point and [the animals that …or] the species that… get on the other side of the tipping point in global climate change, they will probably survive… and it will be us doing the work before this tipping point – in order to allow the animals as much time to acclimate to this tip. Birds like Great and Snowy Egrets that nest on these islands could benefit from such foresight. For BirdNote, I’m Michael Stein. Today’s show brought to you by the Lufkin Family Foundation. Sounds of the birds provided by The Macaulay Library of Natural Sounds at the Cornell Lab of Ornithology, Ithaca, New York. Black-crowned Night-heron recorded by D.S. Herr; colony of Great Egrets by T.A. Parker III.